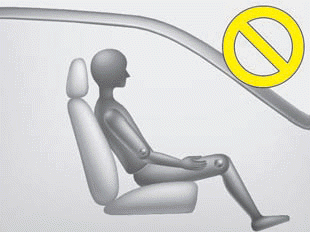 *2) Do not allow children to ride in the front passenger seat. When a smaller child than the same age sits in the front passenger seat, the system may recognize him/her as an infant depending on his/her physique or posture. *4) The PASSENGER AIR BAG "OFF" indicator may turn on or off when a child above 12 months to 12 years old (with or without child restraint system) sits in the front passenger seat. This is a normal condition. 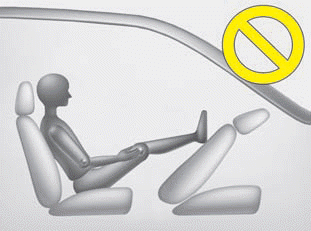 Riding in an improper position adversely affects the occupant detection system (ODS) and may result in the deactivation of front passenger airbag. It is important for the driver to instruct the passenger as to the proper seating instructions as contained in this manual. Do not hang onto the front passenger seat. 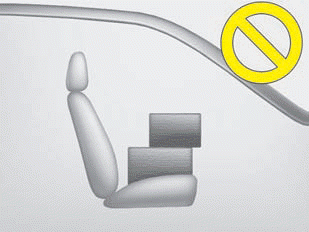 Do not hang any items such as seatback table on the front passenger seatback. 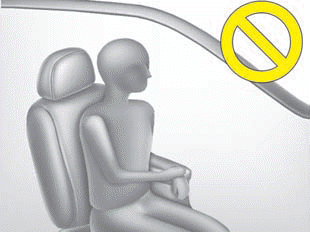 Do not allow an adult passenger to ride in the front seat when the PASSENGER AIR BAG “OFF” indicator is illuminated, because the air bag will not deploy in the event of a crash. 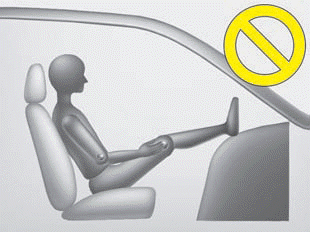 The driver must instruct the passenger to reposition himself in the seat. Failure to properly position yourself may lead to airbag deactivation resulting in airbag non-deployment and in a collision. 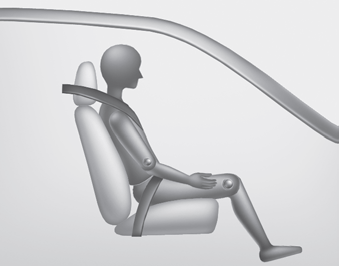 If the PASSENGER AIR BAG “OFF” indicator remains illuminated after the passenger repositions themselves properly and the car is restarted, it is recommended that passenger move to the rear seat because the passenger's front air bag will not deploy. Any child age 12 and under should ride in the rear seat. Children too large for child restraints should use the available lap/shoulder belts. No matter what type of crash, children of all ages are safer when restrained in the rear seat. 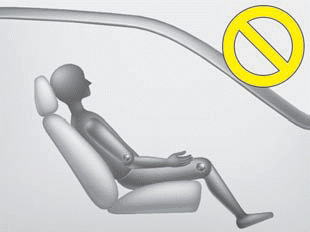 Do not modify or replace the front passenger seat. Don't place anything on or attach anything such as a blanket, front seat covers or after market seat heater to the front passenger seat. This can adversely affect the occupant detection system. If the occupant detection system is not working properly, the SRS air bag warning light on the instrument panel will illuminate because the passenger's front air bag is connected with the occupant detection system. If there is a malfunction of the occupant detection system, the PASSENGER AIR BAG “OFF” indicator will not illuminate and the passenger's front air bag will inflate in frontal impact crashes even if there is no occupant in the front passenger's seat.